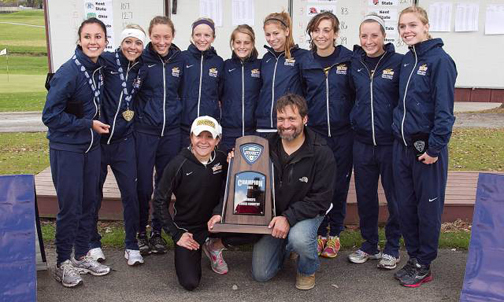 Assistant Coach Sara Vergote and Head Coach Kevin Hadsell held the MAC Championship trophy as the women's cross country team posed for a photo. The Toledo women’s cross country team can check off one of its season objectives, as it scored a conference record-low 33 points to win the Mid-American Conference cross country championship Saturday at Muncie Elks Country Club in Indiana. The win gives the UT women’s program back-to-back conference titles for the second time in school history. All five of Toledo’s scoring runners earned All-MAC honors. Seniors Emma Kertesz and Ari Fisher and sophomore Megan Vogelsong made first team, while juniors Kaylin Belair and Kristal Studer earned second-team recognition. As has been the case all season, Kertesz led the way for the Rockets, finishing in second place with a time of 20:48.4. Close behind was Fisher, a two-time MAC champion, who posted a third-place finish in her first race of the season, being clocked at 20:53.5. Vogelsong came in fifth place with a time of 21:11.3. Rounding out the scoring five, Belair finished in ninth place with a time of 21:22.9, and Studer finished 14th in 21:41.9. Freshman Liz Weiler (18th place, 21:47.4) and Mackenzie Chojnacky (26th place, 22:00.9) crossed the line for UT sixth and seventh, respectively. Another pair of freshmen, Brooke Tullis (27th place, 22:03.0) and Priscilla Timmons (29th place, 22:097.5), completed the UT lineup. In the men’s race, Toledo finished in sixth-place with a score of 128 points. Senior Jonathan DeWitt led the way for UT, finishing in seventh place with a time of 24:44.9 and being named to the All-MAC first team for the second straight year. Earning second-team All-MAC honors for the second year in a row was junior Nick Thomas, who came in 13th place with a time of 24:53.6. Redshirt-freshman Jake Kasperski was the third Rocket finisher, crossing the line in 28th place with a time of 25:12.7. Freshman Hillary Serem (35th place, 25:23.7) and junior Elliot Livensparger (45th place, 25:40.4) completed Toledo’s scoring five. Hadsell was named the MAC Women’s Coach of the Year after the racing was completed; it is the fourth time the honor has been bestowed upon him. He won the award in 2001, 2002 and 2010, along with conference championships. Hadsell has kept UT a fixation in the upper-echelon of the MAC, as the Midnight Blue and Gold have finished in the top two in the conference seven times in the last 11 years. The men’s and women’s teams will race in the Great Lakes Region championship meet at Ottawa Park Saturday, Nov. 12. The men’s 10K race will go off at noon, followed by the women’s 6K race at 1:15 p.m.
Beginning today, students have a new reason to open up their daily eBlade. Monday, Oct. 31, marks the launch of a new version of the news vehicle, representing a significant enhancement to the user experience. And this enhanced experience comes with the ability to win tuition and fees for the semester, as well as iPads. Students receive an email in their Rocket accounts each morning and access the eBlade by following the login information. The system tracks their use of the eBlade; the more they use it, the more they increase their chances to win. 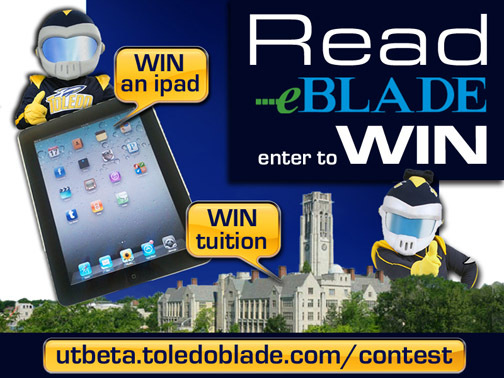 For more information on the eBlade and the contest, visit myUT.utoledo.edu. Seven different members of Toledo scored goals Sunday, as the Midnight Blue and Gold’s offense exploded for an 8-0 victory over Ohio in a quarterfinals match of the 2011 Mid-American Conference Tournament at Scott Park. The Rockets’ eight post-season scores are a MAC tourney record, surpassing Miami’s total of seven tallies vs. Buffalo in 2001. 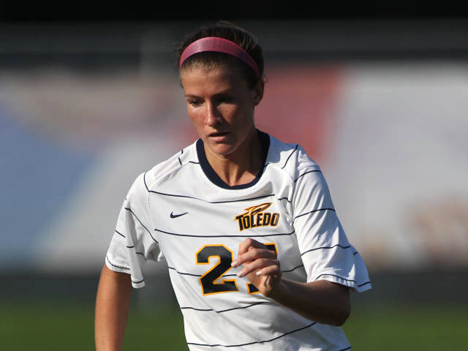 Sophomore Rachel MacLeod had two goals and one assist in Toledo's record-setting 8-0 victory vs. Ohio in the quarterfinal round of the 2011 MAC Tournament. UT received two goals from sophomore Rachel MacLeod and single tallies from junior Kristen Mattei, sophomore Nicole Gyurgyik, freshman Rio James, senior Ana Reynolds, junior Natalia Gaitàn and sophomore Emily Tustin to lead the charge against the Bobcats (7-11-2). The 2011 MAC regular-season champions produced four goals in each half to coast to the lopsided shutout victory. The Rockets finished with a 23-12 edge in shots to defeat Ohio for a third consecutive season in the MAC tourney, as they improved to 10-1-4 in post-season play under Head Coach Brad Evans. MacLeod, Gyurgyik, Mattei and Reynolds each had a team-high four shots to move UT into the semifinals for the sixth-consecutive year. With today’s triumph, UT (12-6-2) will host the semifinals and championship match next weekend on its home field. The three-time conference tourney champs will entertain No. 5 seed Buffalo Friday, Nov. 4, after the Bulls downed No. 4 seed Kent State, 2-1. In other MAC Tournament action, No. 2 seed Central Michigan defeated No. 7 seed Akron, 2-1, and No. 3 seed Western Michigan blanked No. 6 seed Ball State, 1-0. The two-time defending MAC Tournament Champion Chippewas will tangle with the Broncos in the other semifinal contest Friday. Between the posts, senior Vicki Traven worked the opening 72:56 and had to make two saves to collect the victory. Redshirt freshman Kelsey Borowitz came on for the final 17-plus minutes and tallied three stops to preserve the shutout. 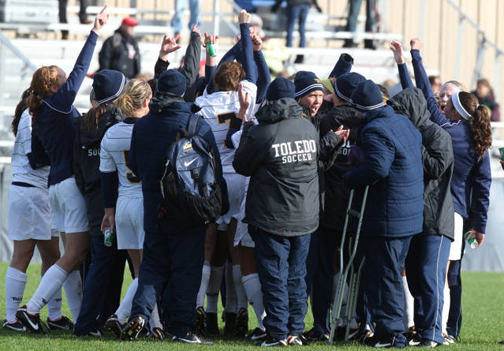 The Rockets celebrated after beating Ball State, 2-0, to win the 2011 Mid-American Conference regular-season championship for the third time in the last four seasons. Toledo scored a pair of goals off corner kicks and claimed a 2-0 win against Ball State Thursday at Scott Park. With the shutout victory, the Rockets wrapped up the 2011 Mid-American Conference regular-season championship for the third time in the last four seasons. UT’s blanking gives Head Coach Brad Evans and the Midnight Blue and Gold an overall record of 11-6-2 to close out the regular season, including 9-1-1 in league play. The Rockets now will be the top seed for the MAC Tournament for the second consecutive season, which opens Sunday, Oct. 30, with quarterfinal-round match vs. No. 8 seed Ohio at 1:05 p.m. at the corner of Hill Avenue and Parkside Boulevard. The University of Toledo Division of External Affairs has agreed to pay the admission fee for the first 100 UT students with their UT ID to Sunday’s contest against the Bobcats. Toledo cashed in on its only legitimate scoring opportunity in the opening stanza in the regular-season finale when senior Danielle Case tallied her second goal of the season at 15:42. The marker was setup beautifully on a corner by junior Natalia Gaitàn to Case on the Ball State back post. The tri-captain found a seam in the defense and out-jumped the opposition, hammering the header to give the home team a lead they would not relinquish. Moments before the first half ended, the Cardinals (9-8-3, 4-5-2 MAC) were presented with an opportunity to draw even on a header by Brigit Reder. Teammate Pavla Benyrova played in a free kick from about 25 yards out to Reder in the middle of the UT goal box. The Cardinals’ defender extended high into the air and blasted a header that skimmed over the bar and out of play to keep the difference 1-0 at the intermission. The Rockets then added to their advantage when sophomore Rachel MacLeod found the back of the net for the seventh time this fall at 54:44. Gaitàn started the play once again with a well-struck ball toward the Ball State back post to junior Kristen Mattei, who headed it back toward the middle of the Cardinals’ goal box. MacLeod was there waiting for Mattei’s header and promptly placed a header herself into the net to establish a two-goal cushion. Toledo then dodged a bullet moments after MacLeod’s goal with a misplay on defense. UT’s Case had a pass stolen by BSU’s Jasmine Moses deep in its third of the pitch. The Cardinals’ swift-footed forward then found herself one-on-one with Toledo senior goalie Vicki Traven. Fortunately for the two-time defending MAC regular-season champs, Traven came off her line enough and cut down Moses’ angle to the goal to force her shot wide of the target, preserving the shutout. BSU finished the division matchup with a slight 9-8 advantage in shots. MacLeod paced the victors with two shots, while Moses also had two shots for the visitors. UT held an 8-2 advantage in corner kicks to register its third win over BSU in the last four seasons. Between the posts, Traven was called upon to make four saves to collect her seventh shutout of the season. Drug overdoses kill four Ohioans every day, and many of those are from prescription drugs. As part of the initiative to end drug abuse, a UT pharmacy student is assisting the Toledo-Lucas County Health Department with participating in a national event to raise awareness about the issue. A local event on National Medication Take Back Day will take place from 10 a.m. to 2 p.m. Saturday, Oct. 29, at the health department’s main office, 635 North Erie St., Toledo. The program will address a vital public safety and public health issue by encouraging those with outdated prescription drugs or ones that are not being used anymore to be disposed of appropriately. Amy Ninlawong, UT third-year pharmacy student and intern at the Toledo-Lucas County Health Department, researched the National Medication Take Back Day program and received approvals from the Lucas County Sheriff and Toledo Drug Enforcement Administration Office to hold a local event. This is the first time the Toledo-Lucas County Health Department has participated in this event, but the third year there have been drop-off locations in Toledo. Studies show that a majority of abused prescription drugs are obtained from family and friends; this includes taking prescriptions from home medicine cabinets, Schreier said. “If a patient no longer takes the medication or it is expired, there is no need for the medication anymore. Keeping old medication can lead to serious outcomes, such as poisoning, overdose, and drug abuse, for children and adults,” she said. Prescription drugs are not to be disposed of down the sink, flushed or thrown in the trash, but rather through an organized program like Medicine Take Back Day to minimize the harmful effects to the environment. Last year, the Drug Enforcement Administration collected 188 tons of medication on National Medication Take Back Day. For more information and a complete list of drop-off locations, click here. The University of Toledo’s Urban Affairs Center plans to continue a fresh, local food agriculture program on campus through a partnership with a Tiffin family farm. Dave Goodman of Riehm Farms helped Kristy Woodman and her daughter, Karsyn, during a stop on Main Campus last month. The center conducted a survey last fall to gauge interest in such a program, and more than half surveyed expressed interest. This year, UT students and faculty and staff members received a chance to participate in the pilot run of the club. Riehm Farms, located in Tiffin, has partnered with the center to offer fresh vegetables and fruits to the campus community. 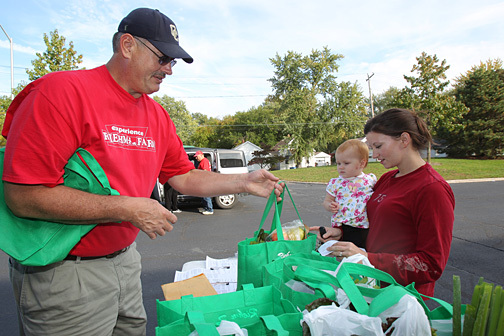 Every week during the growing season, participants can bring their empty canvas bag and exchange with the farmers for a new bag of fresh produce. As part of the weekly program, participants also receive a weekly newsletter filled with recipes and tips on the preservation of produce. Open registration for the next season is expected to begin in November, with produce delivery tentatively scheduled for early June. Payment is due at registration, which is first-come, first-served. The program options include two bags or one bag of produce each week for $32 or $16 a week, respectively. Payments of $640 and $320 for the 20-week season are due at registration. There are nearly 50 people in the Community Supported Agriculture Program. Eckert said UT and Riehm Farms hope the number of campus participants will double in the coming year and reach a goal of 250 overall in the northwest Ohio region. Click here for more information on Riehm Farms. The University of Toledo College of Law will host the Central States Law Schools Association Annual Scholarship Conference Friday and Saturday, Oct. 28 and 29. During the event, 48 scholars representing 26 schools will present research on a variety of law topics, including criminal procedure, constitutional law, tax law and international law. Nine presenters are UT faculty members. The conference will begin with a panel discussion titled “Taking Your Scholarship to the Next Level: Books, Commentary, Consulting” at 4 p.m. Friday, Oct. 28, with scholarly presentations throughout the day, from 8:30 a.m. to 6:15 p.m., Saturday, Oct. 29, in the UT Law Center. Presenters will include faculty from UT, Ohio State University, the University of Akron, Michigan State University, Wayne State University, the University of North Dakota, Louisiana State University and Phoenix School of Law. Those interested in academic law topics are invited to sit in on discussions during the free, public conference. The Central States Law Schools Association is a regional organization of law schools dedicated to providing a supportive environment for conversation and collaboration between law academics. The association has approximately 45 member schools. 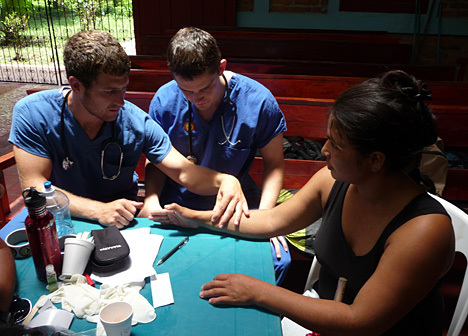 Fourth-year medical students Erik White and Bill Myers examined a patient in Nicaragua. Leon, Nicaragua, has an estimated population of 400,000, making it the second largest city in the country. It’s also one in which reliable and safe health care for those who cannot afford it is a potential concern. The University of Toledo College of Medicine united with 21 medical and nursing students to fund a weeklong trip to Nicaragua during the summer as part of a medical mission to assist Leon residents. The idea of the medical mission to Nicaragua was started a few years back by a former UT medical student who spent time in the country. Since then, the mission has been passed on yearly to a medical student who presents leadership abilities and devotes his or her time to the pursuit of caring for others. 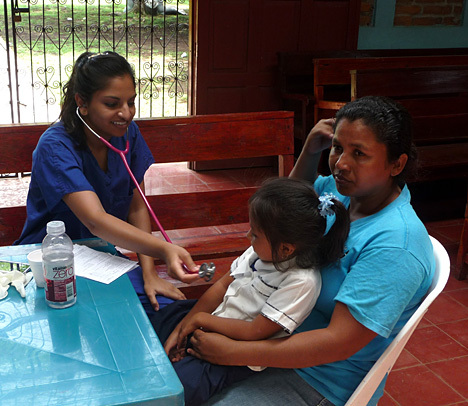 Fourth-year medical student Tanveer Mollah examined a young patient in Nicaragua. Victoria Bradford, a fifth-year medical student from Toledo, was the leader for the recent medical mission. She received help from peers Laura Kistler and Meghan Horn. Students and faculty ran the Nicaragua Medical Mission with help from the UT Medical Mission Hall of Fame. Everyone involved raised their own funds for supplies and medication by holding fundraisers and bake sales and sending donation letters. During their week in Nicaragua, they also partnered with an American nongovernmental organization called El Ayudante, which helped coordinate transportation and clinics. In total, more than 1,000 patients received medical care that week, ranging from pediatrics, dental, OB/GYN and internal medicine. As part of the Women’s Health Initiative, the group provided Pap testing and provided funding to make sure every test was interpreted by pathologists. Money also was left in Leon for patients who may need further testing. “The mission to Nicaragua was a wonderful experience for all students involved and a great way to utilize their skills learned from inside the classroom in different settings,” said Dr. Kristopher Brickman, associate professor and chair of the Department of Emergency Medicine and director of global health. You might blame it on the manga. 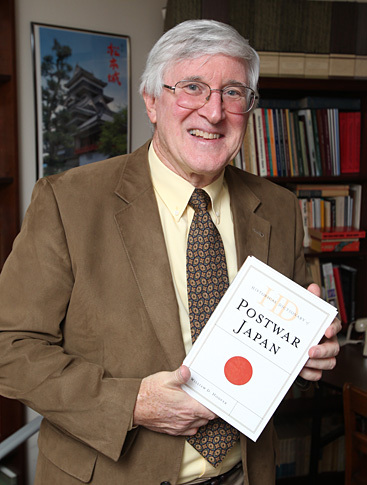 Dr. William D. Hoover, professor emeritus of history, noticed over the years that many students taking his courses on Japanese history might display limited interest in political, military and economic topics, but would perk up immediately when current cultural history was discussed. A course on all aspects of life in postwar Japan seemed ripe for development, he decided. He worked on it while living in Japan for two years, then returned to UT and began teaching what quickly became a very popular addition to the curriculum. Historical Dictionary of Postwar Japan, published earlier this year by Scarecrow Press, a subsidiary of the Rowman & Littlefield Publishing Group, is the result of 10 years of research by Hoover, who has taught Asian history at UT since 1968 and who chaired the History Department for 15 years. As he explained, “It may be called a dictionary, but it’s really an encyclopedia.” In addition to the alphabetical entries, the book includes a month-by-month chronology of events in postwar Japan, charts that trace various national trends, and an extensive bibliography. Hoover revealed that he and his editor differed on what to include: “I told him that I thought most people are interested in social relations, in what makes a nation’s culture: the role of religion, of labor unions, the most important people in fashion. “We finally compromised. Instead of 20 baseball players, he told me, you can have only 10, but make mention of the others in the article on baseball. “It’s likely to be very helpful to a general reader, but a specialist who may know the economics but not the politics, say, or the cultural side, will also find much to use,” said Hoover, who in addition to his UT teaching serves as chair of the local Toledo-Toyohashi Sister City Committee. 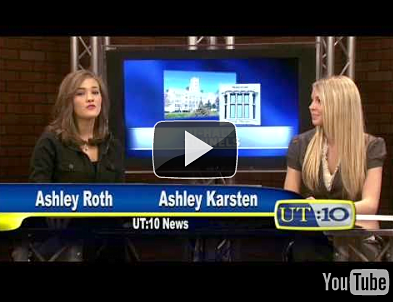 The UT:10 student-run television newscast was selected as a top four finalist for two broadcasts in a national competition held by College Broadcasters Inc., an organization that includes members from U.S. collegiate radio, television, webcasting and other media programs. The nominated segments are “UT Myths and Legends” about the urban legends on campus such as the origins of Centennial Mall in the category of Best Special Broadcast and “March 29 Sports” coverage of the WNIT basketball playoffs in the category of Best Sportscast. The awards will be given out at College Broadcasters Inc.’s national conference. Ashley Karsten and Carina Cornieles, student producers of UT:10, will attend the awards ceremony Wednesday through Friday, Oct. 26-29, in Orlando, Fla.
Karsten has worked with UT:10 for three years, and Cornieles has been involved for two years. “Without these women, without the work and coordination they put into it, the segments would not have been at the level they’re at now,” Layng said. Layng said she hopes the newcast can grow with the recognition from College Broadcasters Inc. to a more rigorous program with more faculty.